Institute for Equine Therapeutic Options | "Knowledge is Power"
A very good article on Fascia written by Dr Hammer. This article was published in April 2014, in the newsletter American Chiropractic Association. The knowledge that normal muscle function depends on the fascial system and between 30 and 40 percent of the force generated by muscle is due to its surrounding fascia can be compared in science to adding a new element to the periodic table of elements. Science has dismissed the value of a connective tissue structure that encompasses our whole body both internally and externally. Carla Stecco, MD, elaborated this dismissal in her upcoming text entitled, Functional Atlas of the Human Fascial System (Elsevier 2015): “In anatomy text books, only local areas of fasciae are described and they are characterized by only one of their minor functions: as an opaque covering.” In her preface, she adds that most anatomists view connective tissue as something to remove so that joints, muscles, organs and tendons may be studied carefully. In fact, it has now been established that the basic function of joints, muscles, organs and tendons requires a normal, functioning fascial system. Research demonstrates that more than 30 percent of the force generated from the muscle is transmitted not along a tendon, but rather by the connective tissue within the muscle and fascia contains mechanoreceptors and proprioceptors. In other words, every time we use a muscle, we stretch fascia that is connected to spindle cells, Ruffini and Paccini corpuscles and Golgi organs. The normal stretching of fascia thus communicates the force of the muscle contraction and the status of the muscle regarding its tone, movement, rate of change in muscle length and position of the associated body part to the central nervous system (CNS). An important question now arises: What if the fascia, where these receptors are located, is restricted due to increased viscosity or is chronically overstretched? As receptors are activated by pressure or stretch, is it possible that the receptors, which must be free to function, are inhibited? Could inhibition of receptor function provide altered feedback to the CNS? The fascia is therefore much more than an “opaque covering.” It should probably be designated as another organ of the body. Something else to consider: The acupuncture system is within the fascial system. Langevin described the network of acupuncture points and meridians as a network formed by connective tissue (fascia). Practitioners must understand what causes fascia to become pathological and why it disrupts function. Ultimately, they need to know how to restore normality to the fascial system. This article is a very short introduction to the subject of fascia, but certain anatomical and physiological information has to be understood. Muscles are covered by specific types of deep fascia, designated as either epimysial or aponeurotic fascia. In the extremities, a thin layer of epimysial fascia called the epimysium envelops the surface of each muscle. It surrounds the entire surface of the muscle belly and separates it from adjoining muscles. It gives form to all of the extremity muscles. In the extremities, the epimysium is covered by aponeurotic fascia (AF). The fascia lata is aponeurotic fascia that covers the whole thigh and buttock like a stocking and slides over the epimysium of the muscles beneath it. AF is the “well-defined fibrous sheaths that cover and keep in place a group of muscles or serve for the insertion of broad muscles.”. Some examples of AF are the thoracolumbar fascia, the fascia lata and the fascia that covers all of the extremity muscles. A principal function of the AF is to transmit the force (myofascial continuity) of the muscle groups it covers by way of myofascial expansions or insertions. These expansions insert into the periosteum, the paratenons, neurovascular sheaths and the fibrous capsules of joints. During forward movement of the upper extremity for example, the clavicular fibers of the pectoralis major (epimysial fascia) upon contraction stretches the anterior brachial aponeurotic fascia. The biceps is contracting, thereby stretching the antebrachial (aponeurotic) fascia and by way of the lacertus fibrosus to the flexor carpi radialis and the thenar muscles. This sequence has been verified by dissection. Similarly, the quadriceps muscle inserts into the tibia by way of its tendon and continues on to a myofascial expansion that passes anterior to the patella to the anterior knee retinaculum. The Achilles tendon connects from the calcaneus to fascial attachments to the plantar fascia over the back of the heel and to the heel fat pad. Every movement of the body will stretch particular patterns of intrafascial receptors, especially in the deep fascia. The firing of receptors embedded in the fascial network represents the perceptive continuity necessary for normal unimpeded movement and the transmission of information proximally and distally to adjoining muscles and to our CNS. AF helps transmit the force of the muscles it covers and is innervated mostly in its superficial layer. Aponeurotic fascia in the extremities is separated from the epimysium by loose connective tissue, which allows normal glide between the two fascial layers. The AF is made up of two to three layers of parallel collagen fiber bundles, densely packed, separated by a thin layer of its own loose connective tissue. Each layer slides independently over its adjoining layer. The loose connective tissue with normal viscoelasticity allows normal tissue gliding. This gliding function becomes abnormal when the loose connective tissue viscosity increases. Closely connected to the epimysium is an intramuscular fascial layer called the perimysium. The perimysium surrounds the muscle bundles (fascicles). Both the epimysium and perimysium are an organized framework that transmit the force produced in the locomotor system. Both the epi and peri are thickened in tendinosis and with immobilization. From a sensory point of view, the chief proprioceptors for muscles are muscle spindles that are localized in the perimysium. Their capsules connect to the epimysium and fascial septae. The chief sensory components of muscles, the spindle cells, reside in the fascia. Finally, there is the endomysium, which covers every muscle fiber and separates fibers from each other to allow individual fiber gliding. The fact that spindle cells are in the fascia implies that if the fascia is altered — restricted or densified — the spindle cells may not function normally, depriving the CNS of necessary information about joint movement, muscle coordination and position. Spindle cells represent a common final pathway, since all proprioceptive input from fascia, ligaments, skin, etc., goes to the dorsal horn. The dorsal horn has collaterals that synapse on the gamma motor neurons causing reflex activation of spindle cells. Spindle cells are active even during sleep, and they must be stretched during muscle contraction or passive stretch to become activated. It is therefore probable that if the spindle cells are embedded in thickened, densified fascia, its ability to be stretched would be affected and normal spindle cell feedback to the CNS would be altered. Siegfried Mense, MD, one of the world’s leading experts on muscle pain and neurophysiology, when questioned about fascial adhesions having an adverse effect on spindle cells, answered: “Structural disorders of the fascia can surely distort the information sent by the spindles to the CNS and thus can interfere with a proper coordinated movement,” and “the primary spindle afferents (Ia fibers) are so sensitive that even slight distortions of the perimysium will change their discharge frequency.” When our patients complain that the last thing they did was the cause of their pain (i.e., “must have gotten out of bed wrong”), they are already in an uncoordinated situation. What is the actual mechanism of fascial disruption creating abnormal sensory afferentation? One of the chief causes of fascial restriction is related to a substance called hyaluronic acid (HA). HA is a high molecular weight glycosaminoglycan polymer of the extracellular matrix. Among its many functions, HA is a lubricant that allows normal gliding between joints and between connective tissue. The concept of gliding within the fascial system is crucial for normal fascial function. Normal gliding between the layers of fascia surrounding the muscle and within the muscle depends on the normal hydration provided principally by HA. HA is already proving successful when it is injected into osteoarthritic knees or frozen shoulders. A major location of HA is in the loose connective tissue between the deep aponeurotic fascia and muscle (where aponeurotic fascia slides on the epimysium), the loose connective tissue between the two or three layers of the aponeurotic fascia and between the intramuscular fascia. Loose connective tissue appears as an irregular gelatinous mesh containing mainly HA, some fibroblasts, collagen and elastic fibers. “If the HA assumes a more packed conformation, or more generally, if the loose connective tissue inside the fascia alters its density, the behavior of the entire deep fascia and the underlying muscle would be compromised. This, we predict, may be the basis of the common phenomenon known as ‘myofascial pain.’ There is evidence that if the loose connective tissue within the fascia has increased viscosity, the receptors will not be activated properly. Densified HA also alters the distribution of the lines of force within the fascia. In this environment, pain and stiffness may be created with stretching, even within the physiological ranges. When the HA chains become concentrated, their viscoelastic properties are altered, and this contributes to myofascial pain and the myofascial pain syndrome. There are corroborating studies that demonstrate the relationship between HA and myofascial pain. Under tissue stress, like tissue injury, hyaluronan becomes depolymerized and lower molecular mass polymers of hyaluronan fragments appear. These smaller HA fragments signal to the host that normal homeostasis has been profoundly disturbed. Smaller HA fragments contribute to scar formation. With overuse and trauma, HA becomes fragmented and proinflammatory. “By increasing the concentration of HA, HA chains begin to entangle, conferring to the solution distinctive hydrodynamic properties: the viscoelasticity is dramatically increased.” Other studies show that thoracolumbar fascia shear strain was approximately 20 percent lower in human subjects with chronic low-back pain. This reduction of shear plane motion may be due to abnormal trunk movement patterns and/or intrinsic connective tissue pathology. Fascial thickening has been held responsible for chronic pain in both the neck and lower back. In the neck study, the thickness was found in the loose connective tissue, rather than the collagen fibers. In the lowerback study, the chronic low-back pain group had approximately 25 percent greater perimuscular thickness and echogenicity, compared with the non-low-back pain group. In the chronic neck-pain study, the variation of thickness of the fascia correlated with the increase in quantity of the loose connective tissue, but not with dense connective tissue. The value of 0.15 cm thickness of the sternocleidomastoid (SCM) fascia was considered as a cut-off value that allows the clinician to make a diagnosis of myofascial disease in a subject with chronic neck pain. Restoring deep fascial glide requires a method of reaching the deep fascia, especially since this is the principal location of the spindle cells and the HA. In a study where the tissue was sensitized equally from the skin to the deep fascia in the erector spinae muscles, longtime sensitization to mechanical pressure and chemical stimulation remained in the deep fascia rather than the superficial areas. Another study compared the methods of manual effects on restoring HA fluidity. They compared perpendicular vibration and tangential oscillation with constant sliding motions. The perpendicular and tangential motions caused a greater HA lubrication than the sliding method. This demonstrates why it is important to treat an area long enough. The treatment area is less than 2 cm2 and usually requires between 2 to 4 minutes until palpation reveals a gliding sensation rather than a densification. As we treat the HA fragments, which are proinflammatory, they finally reach a size where they become anti-inflammatory. This resultant reduction in inflammation takes about 48 hours. This may explain the possible side effects of continued pain after treatment. It is recommended that the same area should not be treated for at least four days or more. Vertical-type pressure using elbows, knuckles and Graston Technique® is necessary to effect this change. • The fascia is a sensory organ. • Normal muscular function requires that its surrounding fascia be hydrated to allow normal tissue gliding. • Improper tissue gliding is directly related to mechanoreceptive and proprioceptive insufficiency and muscle incoordination. • Dysfunction follows along myofascial kinetic chains, especially those that relate to both the anatomical myofascial and acupuncture meridian fascial planes. • A thorough case history that considers areas of previous trauma or surgery may reveal fascial densities responsible for present complaints. • Functional testing and palpation of fascial planes are a primary diagnostic method. • Treatment of affected points should be continued until normal density is palpated and negative functional testing improves. Much of the research regarding these questions can be found in the U.S. National Library of Medicine, National Institutes of Health. As we read more research articles and bury our heads in fascia specific books, our fascination for all of its implications for whole body health just keeps expanding. You have to understand that all of this information is adapted from human medicine at this point. There are however some amazing equine anatomists whether in Australia or Europe doing equine fascia dissection and we are anxiously waiting for the published studies. Traditionally, fascia has, for centuries, been essentially relegated to be just the “white packing stuff” around the muscles. However, over the past few years, the huge paradigm shift in how we look at fascia and what it means for movement and health, helps us better understand how dysfunction takes place. Currently, fascia is being recognized as the “Cinderella” tissue of medical research. The latest studies have yielded astounding insights regarding the importance of this body wide tensional network. Especially important are the implications for musculoskeletal medicine. Stecco et al, in their 2008 research, had already recognized that the superficial layers of the body are in fact, more densely populated with mechanoreceptors than tissues situated more internally. This form of connective tissue possesses an incredible intrinsic “rubber band like action.” Using the example of biceps muscle contraction, the Triceps muscle group fascia is also stretched. After the contraction, the Triceps fascia will literally and instantaneously, spring back to its previous position. Kram and Dawson, 1998 described the “catapult mechanism” and observed that the tendons and fascia of the legs, for instance are tensioned like rubber bands. Fascia, for better or worse, possesses the ability to contract independently of the muscles it surrounds. It responds to stress without any conscious command from our brain. In the case of injury, it is a big deal, because of lack of activity or inappropriate postural positioning, it will thicken the once-supple fibers. Chronic stress will fuse the connective tissues together in an attempt to protect the underlying muscle. Poor posture, lack of flexibility and repetitive movements will pull the fascia into unconsciously ingrained patterns, in order to stabilize the body. Fascial adaptability is readily demonstrated. 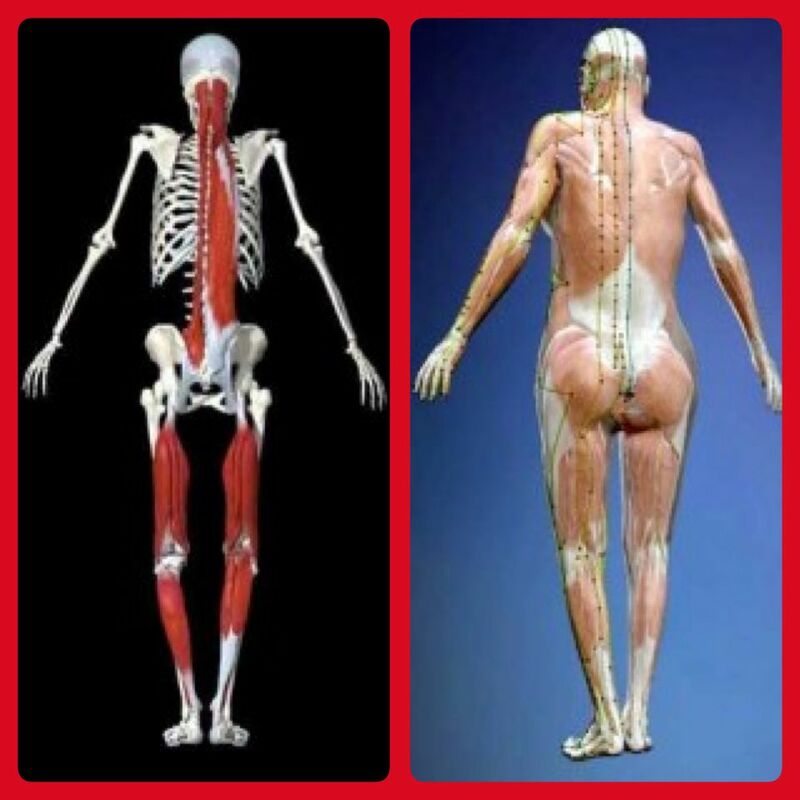 If you palpate the legs of an able-bodied person, it will be observed that, from our normal everyday walking, the fascia on the lateral (outside) of the thigh has developed a palpable firmness. However, when assessing the legs of a wheel chair patient, there is no palpable difference in development, or firmness between the inner and outer sides of the thighs. On the other hand, if you evaluate a professional horse rider’s legs, you would immediately note, that the fascia on the inner side of the legs is more developed and stronger. El-Labban et al., actually conducted an in-depth study on that subject in 1993. Many riders are very aware of this and could have told them so! Excessive repetitive actions, chronic stress or trauma will increase the density of the fascia and drastically impair movement, circulation and lymphatic flow. It will often result in accumulation of dense fascia, and/or scar tissue. This is usually followed by an area or areas of chronic pain. It certainly makes you understand the power of adaptability. We all need to realize how much fascia is dramatically impacting our movements – for better or for worse. But this is not all bad news! Due to the intrinsic and versatile nature of fascia, and its remodeling capacities, it allows that even major damage is reversible. There are multiple modalities available to rehabilitate fascia. These range from “Rolfing,” to milder forms of manipulative “Myofascial Release,” “Trigger Point Therapy”, to the use of Acupuncture or Acupressure. The latter two has led us to our goal of developing a specific myofascial system of acupuncture. Langevin and Yandow, in their 2002 research project, hypothesized that a “Qi blockage” can be viewed as an alteration in the composition of fascia. Needling or acupressure may bring about cellular change in the fascia. The Vermont researchers have also shown that connective tissue is a sophisticated communication system. We are just scratching the surface of its potential. Thus, the hypothesis that the acupuncture meridian system corresponds to a significant degree to connective tissue planes (Langevin and Yandow 2002) has merit. Acupuncture needle stimulation sends a mechanical signal through this tissue network (Langevin et al. 2001, 2002). Connective tissue consists both of a delicate web with fine branches penetrating all tissues, and major “trunks” forming connective tissue planes that link all parts of the body with each other. Documented efficacy of acupuncture relies, at least, to a major extent, on interaction with fascia. Dr. Langevin demonstrated this effect on certain acupuncture points via her special ultrasound elastography techniques. More studies, with greater number of subjects, and working on different areas of the body, certainly need to be done, before we can “prove” the anatomical correspondence of acupuncture channels with the fascial planes. However, the provocative evidence in Dr Langevin’s study, contains the promise of discovering not only more about human physiology and health, but also the possibility of understanding the scientific mechanisms of acupuncture and being able to explain it biomedical terms. Can you see the relation between fascia and a spider web? Think about it. 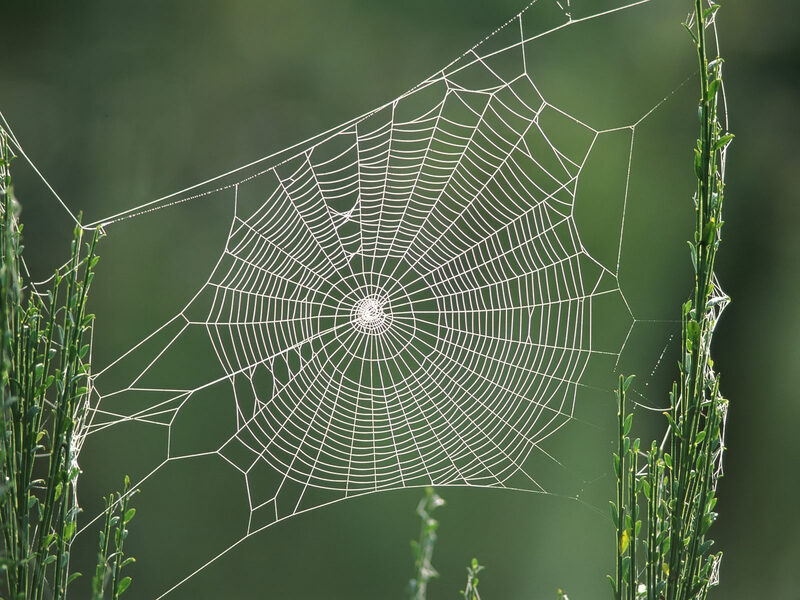 If you touch one part of the web, the whole fabricated net moves (just like a tensegrity model), providing instantaneous information for the spider to act or react. Fascia acts in the same manner. It is a whole body communication system where, if stimulated, transmits a signal to every part of the body. With our most basic knowledge of biology, we learned the term “connective tissue” as a way to describe certain cell types. However, when applied to fascia, the term “connective” takes on a whole new meaning. Fascia is the connective tissue that links every tissue in the body. For example, it connects the skin to the muscle, the muscle to the bone and the organs to each other. Anatomists and surgeons, for centuries, have cut the body up to isolate and define organs, ligaments, muscles and bones; but the body is really parts and organs linked by connective tissue. There is no separation of parts when we view the body on a microscopic level. In a living human or animal being, it is all linked together by fascial connective tissue. Forces induced by, injury, trauma and every day stress will immediately, or over a period of time, cause imbalances in the fascial system. This tensional network may then shorten, thicken, become dehydrated, and consequently affect muscle function and joint mobility. This in turn, is typically displayed as pain, discomfort, stiffness or decreased mobility and altered movement. Under these circumstances, fascia not only loses its ability to communicate via bio-tensegrity, but it also loses its ability to lubricate, insulate, envelope and functionally support the all body systems. It may become excessively bound or stretched and cannot respond rapidly to required functional changes in posture or movement. A localized area of pain or a scar might create adhesions in the fascial planes, which will become quite detrimental if not treated or at least released. Treatment through movement, bodywork, and/or other therapies like acupuncture, chiropractic, osteopathy, etc, will ensure that fascia retains its essential and inherent qualities. “Fascia is your body’s soft tissue scaffolding” says Jill Miller, a yoga and fitness therapy expert. “It provides the matrix that your muscle cells can grow upon and it also envelopes, penetrates and surrounds all of your joints”. Leon Chaitow, a practicing naturopath, osteopath and acupuncturist in the UK, describes fascia as “the new frontier in bodywork.” Fascia is the organ of posture whether we are referring to static or dynamic posture. It will adjust to good or bad posture. When inappropriate chronic posture is present, it will “lock” the body into that posture and cause it to function within a reduced capacity. Kelly Starrett, a Doctor of Physical Therapy in his book “Becoming A Supple Leopard,” feels that “dysfunctional movement patterns may be at the root of your pain.” He emphasizes that a lot of the common musculo-skeletal problems and fascial restriction, that clinicians encounter, result from poor or improper movement. The first thing he addresses is correction of the individual’s dysfunctional movement patterns and bio-mechanical inadequacies. He corrects them via correct movement therapy that results in restoration of full range of motion. Once the joints are properly aligned, the muscles and soft tissues can perform better, and typically, will resolve the initial dysfunction. This, he states, will put the patient in a position where he can safely exercise at higher levels of intensity. 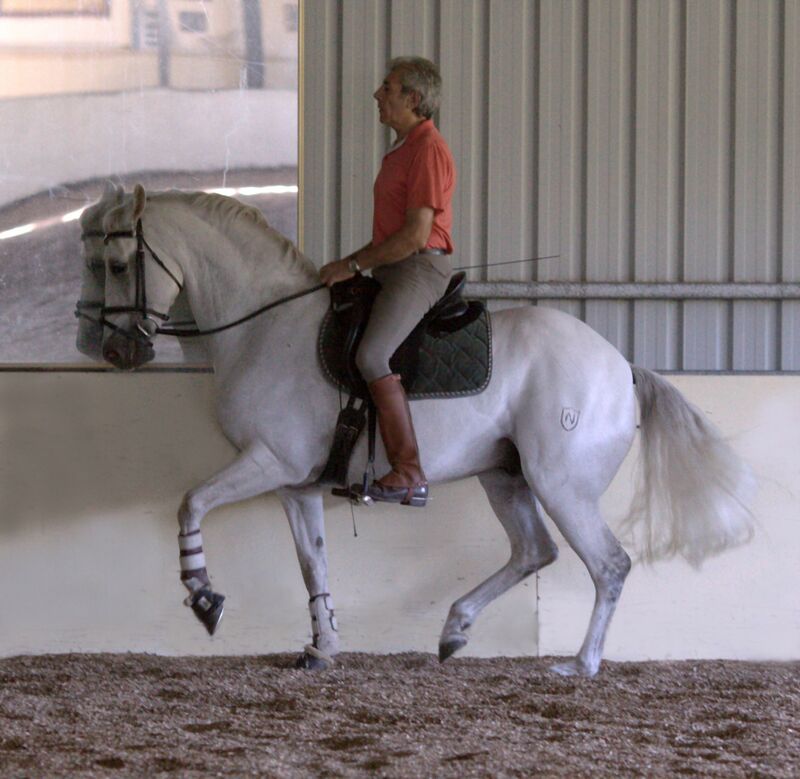 In the horse world, some of the most biomechanically aware trainers, that we know, like Manolo Mendez, Charles De Kunffy, Klaus Schöenich, Colonel Christian Carde, Dr. Gerd Heushmann, all pay special attention to balance and straightness and the role that fascia plays in the biomechanics of the ridden horse. Every day in our practice, we see the fascial constrictions, the gait aberrations and dysfunctional movement patterns. These are present whether they are backyard horses or top athletes. We have learned far too often that these fascial or soft tissue dysfunctions lead to pain and lameness. Once we understand that the fascia of the horse and/or the rider, is going to adjust to whatever posture, or body imbalances exist, we then need to realize that the balance of the natural horse is far from being adequate for the ridden horse. Unless, the inherent crookedness is addressed, the rider will encounter resistance, stiffness or avoidance and he or she, will be forever compensating for it. It is imperative to change the biomechanics of the horse when starting a young horse or when remedially “straightening” an older horse. Riders must absolutely address their own faulty body posture and biomechanical inadequacies if they are not to be carried into their equitation. No wonder, riding is such an art! So even though, the muscles and bones are definitely relevant components, we need to look deeper into the body of the horse and address its posture, gait aberrations, foot balance, living arrangements, and training if we truly want to keep our horses sound and pain free. Restoring the natural intrinsic qualities of fascia (your horse and your own) is not only the key to pain management and soundness, but to unlocking the horse’s performance potential! It has been a long time – too long – since we have communicated and shared our thoughts. We do apologize for this. Unfortunately, most of the last half of the 2012 was spent addressing some very serious health challenges for Dr. R. We are happy to say that they have been overcome and that he is back and stronger than ever! Our goal of sharing information and discussing pertinent health issues remains the same – our, sincere desire to promote and empower you with knowledge of how you can better your horses’ lives. “Natural Crookedness” or “Laterality” is still the focus of our thoughts and practice. We are acutely aware of how deeply these factors affect the horse’s health, performance and soundness. This very topic is a puzzle to many horsemen and many professionals as well. There is considerable argument over terms of laterality, terms such as dominance, weight bearing, free leg verses restricted or supporting leg. Dr. R is writing an extensive paper explaining our concept of right or left forelimb “dominance”. Suffice to say that, at this point, the terms left or right handed are very poor terms. Horses do not have hands. That terminology leads to misunderstanding the forelimb biomechanics of man, who is a biped vs. the forelimb of the horse who is a quadruped. That paper will come out soon in a forthcoming blog. Correcting the crookedness and changing the biomechanics is becoming an important and sometimes contentious discussion subject, with many different voices, opinions and linguistics being expressed. We are all chasing the same goals that the riding masters from Xenophon onward espoused – masters such as De Carpentry, and Baucher and Nuno Oliveira, who penned these lines: “True straightness consists of being able, while riding on the center line, to perform at any moment, a correct circle in either direction. We have a beautiful example of that type of riding when we look at the picture of Manolo Mendez riding Broga. You feel that he could, at ANY moment do a circle in EITHER direction and utilize any gait (if he were on the center line instead of on the wall). Isn’t this what we all aspire to do? We fully recognize the impact that crookedness has with respect to the performance ability and soundness of our patients. Dr Thomas Ritter beautifully expressed in two sentences (in an article on Natural Crookedness) our whole philosophy and the strong principles that are the foundation of our veterinary practice. These powerful words should be engraved on the doors of every stall, every tackroom wall, and be memorized by each aspiring horse owner or rider, whether they want to go on the trail, jump, do eventing, endurance, dressage, or do any of the Western disciplines! On the news front, we are pleased to announce that we will be organizing another straightness clinic with Klaus Schoneich, the German trainer and author of “Correct Movement in Horses”. The clinic is set for July 20th to 23rd and will be hosted by Hullinndalur Farm in Landrum, SC. It will be fascinating to again analyse the biomechanics of each horse, observe the changes over the course of the clinic and assess the progress of the returning horses. Register online, whether you want to bring a horse or just audit! The book “Correct Movement in Horses” by Gabriele and Klaus Schoneich is presently out of print, but we have been promised a reprint date of September 15th of this year. It will be available then from our website, as well as from other equine book sources in the US. We have already set up quite a number of clinics this year. We will be doing our first seminar since teaching in South Africa in January and are planning to be in Gardnerville, NV on April 6th and 7th (www.equineownersacademy.com). We are also looking forward to participate at the International Veterinary Acupuncture Congress in Louisiana, from May 16th to 19th. It will be followed by the Saddle Fitting Course for Equinology (www.equinology.com) in California from May 28th to the 31st. The rest of the year will see us in England, Canada, Australia as well as back in South Africa. More US clinics are also in the works. Check our calendar for further updates and more details. 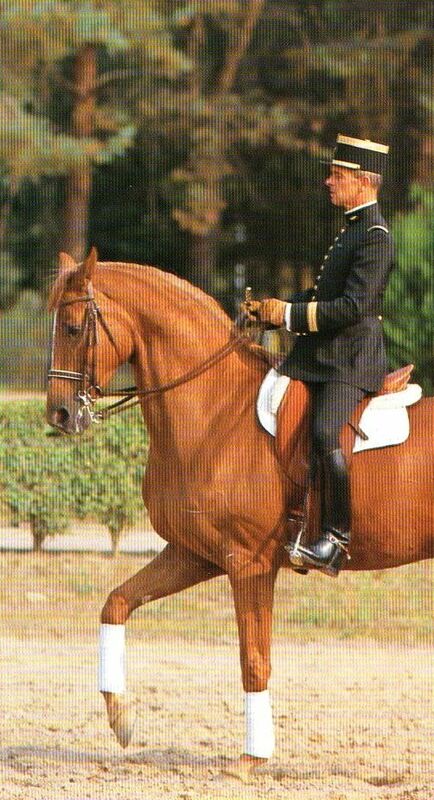 In June of 2012, I had the honor and wonderful privilege of presenting a symposium with Colonel Christian Carde, a former dressage olympian and head trainer and director of the French National School of Equitation in Saumur. I was able to share with him and our audience the muscle hypertension patterns, skeletal pain patterns and the asymmetric foot growth patterns that are so consistently expressed by the “crooked horse”. Colonel Carde then demonstrated the critically important principles of correct riding and training required to produce a straight horse, and why only a “straight” horse can consistently perform at high levels whilst maintaining soundness. To achieve that straightness, Christian Carde first insisted on balance through a soft, elastic but permanent contact. In his mind, a harmonious riding picture is a horse moving with lifted shoulders and withers, engaged hind legs, and showing an up-swinging back. The ultimate goal: a collected horse, moving with self carriage to the finest aids whatever the discipline is. His understanding of the equine biomechanics reflected in his constant demands to the rider for the utmost relaxation and calmness of the horse. Along these principles, he emphasized the need for the riders to keep straightness and softness at all times. He kept reminding them to pat and reward their horses often, and that any movement executed in tension at any time in the training was extremely detrimental to the horses’ ultimate soundness and happiness. He wants the horses to become happy athletes. The following paragraphs define the symbiosis of our work together and the value of a training based on sound biomechanics. Crooked horses simply cannot meet their genetic potential. In my opinion, there are two factors that prevent it from doing so. One: a lack of true and effective straightness training that results in failure to change the biomechanics of the “natural” horse to the biomechanics required of the ridden horse; two: the presence of muscles with hypertension and pain and the accompanying skeletal pain. The changes and approach to meeting genetic potential demands a team approach. We have known since Antoine de Pluvinel (1552 -1620, riding master to King Louis the XIII), that all horses are by nature born to move forward on the forehand and to move with a free moving side and a side where motion is stiffer and more restricted; that “sidedness” we now know as “laterality” or handedness. All horses are either right side dominant or left side dominant. Though the laterality serves them very adequately in nature, it is not compatible for the ridden horse in terms of longevity of performance and soundness. Laterality, plus being on the forehand, result in poor performance. These factors also create so many of the problems veterinarians see on a daily basis. The root source is the omnipresent muscular and skeletal pain that crooked horses have. Veterinarians – especially those trained in integrative veterinary medicine, such as acupuncture, chiropractic, myofascial release etc. – can address the musculo-skeletal issues that keep the horse functional and maintain its performance levels. Knowledgeable body workers and physiotherapists can also help facilitate pain relief and functionality. However, not a single one of these groups of therapists can change the horse’s biomechanics or create a straight horse. They can only manage the ongoing consequences –They cannot cure the root cause. That root cause is a lack of correct training and a lack of knowledge or skills to create the necessary biomechanical changes. Creating straightness is solely the province of trainers and the subsequent riders who truly understand the requirements and can “create” a horse that is more ambidextrous. This is a horse with an up-swinging back that results in a “back mover” instead of a “leg mover.” The good trainers and riders are those who also recognize that the foundation and basis of straightness is extensive proper groundwork involving many weeks (rather than the typical one or two weeks) before a rider is placed on the horse’s back. One more element beautifully articulated by Colonel Carde is the importance of empathy, gentleness and reward as essential aspects of training any horse. All said, the trainer’s and/or the rider’s work can, obviously, be greatly facilitated by removal of the musculo-skeletal pain prior to and during the training, as well as ensuring proper shoeing and saddle fit. Thus, by far and away, a team approach is most favorable to the horse’s ability to meet its genetic potential. The real bonus is that horses, so trained and cared for, can maintain peak performance and soundness for many more years; and that is certainly good for everybody concerned. A few weeks ago, we were honored to participate in the Straightness Training Seminar in Germany, with Dr Gerd Heushmann, Gabriele and Klaus Schoneich, Elizabeth Eversfield and Martin Hanni. Klaus Schoneich spoke first about the differences between the natural and the ridden horse and explained the biomechanics changes that had to take place for the horse to become a content and healthy athlete under saddle. Gerd Heushmann, veterinarian and bereiter, explained once more, the importance of the biomechanics of the horse, according to the old classical riding principles. He stressed the importance of keeping the horse soft and supple, and a willing partner. He quoted Xenophon: “Your horse should be a trusted friend to you, and not a slave”. Kerry was the next lecturer, and the German audience got fascinated but the effects of crookedness on the musculo-skeletal system, and some admitted never having looked at the symmetry and balance of muscles, tendons and ligaments in that manner. Quite a few people came after the presentation to ask him if he had a book out. It sure is in the works…that is, if one can make him sit down long enough to write it. Martin Hanni, trainer/rider at the ARR Zentrum and Elizabeth Eversfield-Koch were the demonstration riders, illustrating what had been explained earlier on. Elizabeth is a member of the Swiss dressage team and has been working with Klaus Schoneich for the past 10 years. She is the “finished” product of the straightening system promoted by Klaus and Gabriele Schoneich. She competed at WEG, in 2010 with a 17yo horse, that had had major health and training issues when she first acquired him. She ended up taking that horse to the ARR Center for retraining and then over the years, followed the Schoneichs’s straightening principles. At the seminar, she did a presentation with a relatively young mare for her. It was a delight to see a horse perform at that level, harmonious dance between horse and rider, just a soft giving hand which invited the mare to come through with an upswinging back and rhythmical suspended gaits. She proves that it can be done, even at the highest level. Dressage or even plain riding, doesn’t have to be “push and pull” or “kick and hold”. These 2 riders demonstrated that harmonious riding with flawless communication between horse and rider does exist. At the beginning of December, we were delighted to bring Klaus Schoneich from Germany, for our first “Straightening the Crooked Horse” clinic here in the South East. The 4-day clinic was hosted very efficiently by Sara Lyter at her beautiful “Hulinndalur Farm” situated at the southern border of North Carolina, near Columbus. The first day started with a well attended lecture on the Equine Straightening System developed by Klaus and Gabrielle Schoneich at their Center for Anatomically Correct Horsemanship, in Germany. The theory presented by Mr Schoneich exposed the secret behind the differing biomechanics of the natural horse versus the ridden horse. The lecture, supported by illustrative pictures and videos, as well as explicit drawings, explained why every horse owner, trainer, rider, veterinarian or hoof practitioner needs to be aware of the inherent crookedness of horses. The second part of the presentation showed the essential elements and necessary steps needed to best remedy the problem. All participants stayed at the farm for lunch. The meals were beautifully catered by a local chef. The first part of the afternoon was set aside for the assessment and videoing of three horses. That was followed by analysis and discussion of each horse’s movement. The slow motion capabilities of the camera allowed the participants to clearly see the negative impact of crookedness. The rest of the afternoon saw the assessment of all the other participating horses. Each horse was individually lunged and evaluated by Mr Schoneich who shared his thoughts on conformation, shoeing, trimming, nutrition as well as saddle fitting. Klaus did most of the lungeing on the first two days of the clinic, live-commenting on the work he was doing with each horse, and explaining at great length when people had difficulties grasping the concepts. 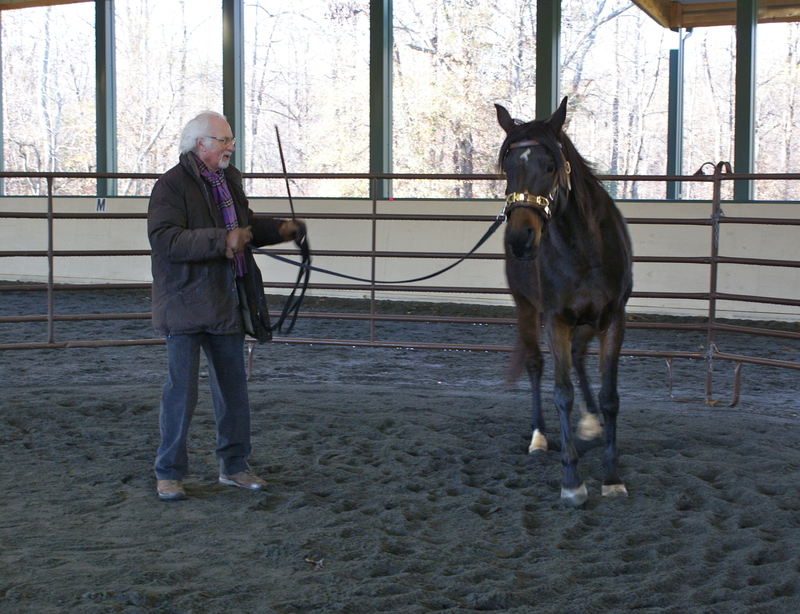 The following days, the owners went on to work their own horses, whilst Klaus was guiding them and helping them position their body more effectively. He relentlessly went into the round pen with the owner. He taught them to watch intently, feel with compassion and anticipate swiftly. He wanted them to use their “horse sense”. Who would have thought that lungeing could be so different from what they had been taught over the years? The goal, as explained by Klaus is, to take control of the shoulders in order to address the centrifugal and shear forces that are generated. Four days of training is really a short time to try to accomplish anything, but we did feel that all of the horses showed significant improvements. We had a wide mix of horses/riders/disciplines, which made it very interesting since we were able to observe different phases of training. Every day, everybody stayed until the last horse was worked, which ended pretty late at night. Mr Schoneich with his amazing energy and unfaltering patience was determined to teach each and every one how to achieve proper straightness training. This short format clinic was just an introduction for postural rehabilitation and straightness training, and has be continued by the owner/trainer. Through the first step of the straightness training, the horse learns to balance itself on the lunge and becomes more ambidextrous. It is only when the horse is no longer falling out or leaning on its shoulder, that he will start working with an upward swinging back. The horse is then ready for its training under saddle. We are already working on the 2012 dates, for Klaus and Gabrielle Schoneich’s next clinic. We are hoping to bring them to both, the East and West Coasts. Stay tuned and keep checking the website for clinic details. Or, understanding what we need to do, to transform the natural horse into a correct riding horse which will stay sound and free of pain over the years. Klaus Schoneich and Gabriele Raechen-Schoneich from Germany, authors of the book “Correct Movement in Horses – Straightening the Crooked Horse” directed the book to all riders be they competitive or pleasure. Their training system is the fruit of their work and analysis of thousands of horses over a span of more than 25 years. No! Straightness training is not a new fad; it was acknowledged by the old riding masters and is addressed every day by many trainers around the world. 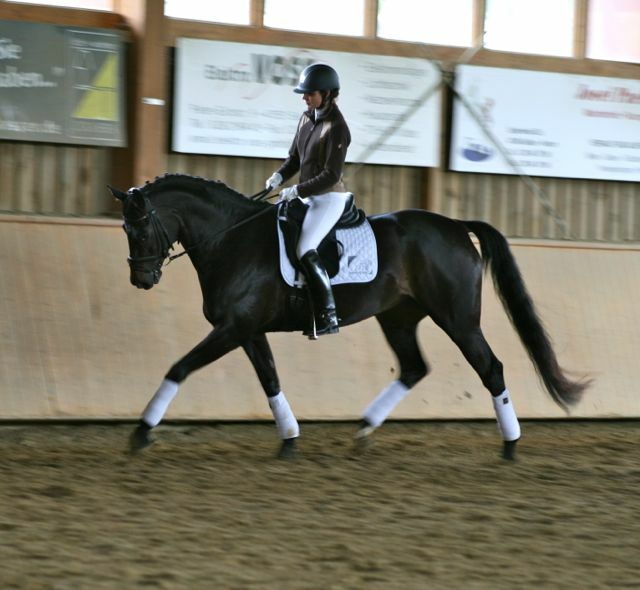 Straighteness is one of the pillars of the German training scale, and is currently mentioned in numerous dressage articles. We all recognize that horses in their natural state carry far more weight on their forehand than their hindquarters. Modern breeding programs have compounded the problem by developing stronger, larger and athletic horses with huge strides and powerful hind ends that drive the forces into the dominant shoulder. Riders are also very much aware that most horses are more comfortable going in one direction versus the other, and bend more easily on one side than the other. This is because, horses like people have a dominant side and literally they “put their best foot forward” and end up using the dominant front leg as a post, putting more weight on that leg and shoulder, which of course affects the hind end considerably. So, what makes us believe that the Schoneichs are offering something different? First of all, they want us to understand the biomechanical differences between the natural horse and the ridden horse. The horse must be physically prepared for the right muscles to develop in order to, not only carry himself but later on, the rider. This takes time, patience and technique. That was the goal of the work in the pillars that the old classical dressage masters used before starting the under saddle work. Secondly, remember that a crooked horse is an unbalanced horse; an unbalanced horse becomes tense and resistant to the aids. Therefore, crookedness should be addressed at an early stage. Each hind leg should bear equal weight if we want to avoid muscular compensation. We must train the natural horse to be more ambidextrous, just like top human athletes truly are. So, unless these essential issues of crookedness and forehand heaviness are resolved in the early training (or truly corrected later), the average rider/trainer will be dealing with these problems on a daily basis. The crookedness creates gait aberrations that are manifest in pleasure horses as well as in many top level horses of all disciplines. To develop the pushing power by riding forward requires skilled riding and will only emphasize the crookedness if the rider doesn’t understand the root of the problem. The straightness techniques developed by the Schoneichs, very clearly define the three steps of training that must be achieved before you even put a saddle on the horse. We have talked about the lightening of the forehand as a first condition, along with developing ambidextrousity through softness and diagonal re-balancing of the center of gravity. The third condition requires the horse to be able to work forward and downward without losing its lateral, nor longitudinal balance. Only then, and then only, would they start the work under saddle! The horse has to have the physical ability to bring his trunk up and move with an upswinging back before the rider can actually start training from the saddle! Taliana, is a 3 yo Hungarian warmblood, out of a Weltemeyer line dam, by Fabuleux, a Hanoverian stallion from Briddlewood Farm. She is, from being born on our farm, the subject of our experiment with the straightness training implemented by Klaus and Gabriele Schoneich. Fresh from our time in Germany, I could not wait to get her started. She had had no training at that point when I started working with her 8 weeks ago. Her training unfortunately, due to our work commitments and obligations, has not been as consistent as I would have liked but all in all, she has had, at least 5 working weeks. We did an initial gait analysis/ body evaluation at the start of her training and found some minor muscle issues and soreness just from being a 3 yo living outside as any other 3 yo would. It is in our opinion, to best have the body soreness and pain resolved before the horse starts working. The Schoneichs on the other hand, feel that the body issues will resolve if the crookedness is corrected. We, unfortunately haven’t spent enough time at the Center for Anatomically Correct Horsemanship to assess that fully, and it would be our desire to do a formal study to pursue that further. Hey, we only need time and money…just like everybody else on this planet! Tali has been a moderate right front limb dominant horse, which means that she wants to come IN, on the circle when lunged to the right, using that right front as a post. Going left, she wants to fall out on an OUTER circle (centrifugal force). At this stage, I have definitely seen a difference in her way of moving, from when I started. She has acquired a clear rhythm and is getting more balanced longitudinally and diagonally. As Gustav Steinbrecht would have expressed, she is starting to “use her 4 legs equally to step forward in the direction of movement”. We still haven’t reached the “forward and downward” that the Schoneichs would expect at the end of an 8 week period, but that could be in part, due to my own training inability. I am learning as I am teaching her, which might not be an ideal scenario, but I am on a quest for straightness and true lightness, so Tali will be one of my many teachers, I presume! We will keep you apraised of her progress and share with you, hopefully the highs and also, maybe the frustrations of her training! 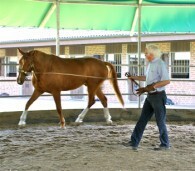 Klaus Schoneich from the Centre for anatomically correct horsemanship, working a young horse. After working the horse on the longe following the Schoneichs’ specific instructions, the next step is to work the horse with the rider up. Even advanced riders very often must seek a better balance and develop a truly independent seat. The Schoneichs are masters at creating individual exercises for the rider to achieve that goal. These exercises are being done by the rider while being longed. For my part, as a veterinarian specializing in integrative as well as conventional medicine, I have recognized that all horses, regardless of discipline, develop the same sets of muscle pattern pain and pathology. This observation is in my opinion, without question, related to the laterality of the horse. In horses with right forelimb dominance(75 to 80% of the population) the muscle pattern is the same, as in the 20 to 25 percent of the left forelimb dominant ones who then present a mirror image of the right forelimb dominant horses. The same can be said for the chiropractic and fascial patterns. It does not stop there, it relates also to the pathology that we see in the joints (especially the stifles and hocks as well as in spinal facet joints.) All these pathological effects are related to the combination of “shear” and “centrifugal” forces that are generated when the horse with uncorrected laterality problems work in circles, with their weight on the forehand. I will be expanding greatly on this subject in chapters of a book that I am currently writing. When they take a horse in for training, they do a full video assessment of its current way of moving on a circle, a shoeing and foot balance evaluation as well as a saddle assessment. I am, personally, concluding that it is also important to do a full physical examination including acupuncture, chiropractic, limb palpation and flexion tests. It is my feeling that if the horses’ physical problems can be sorted out previous to the hard work of rebalancing, that the entire process may go more smoothly. Even though the longe work may only be twenty minutes, the horse has to use his muscles in a very different way that can lead to more muscle soreness. I recognize my need to experience a large number of horses that are started relatively “pain and pathology free” to be able to speak with more authority on this aspect. Many of the horses that are brought to the Schoneichs come because the owner’s has been advised that the horse is not “good enough” to do the job or its career is finished because of pathology. The high rate of success that they have with this type of horses speaks volumes. Though, the system can stand on its own, we would maintain that success may come even more quickly when accompanied by a pain free state. There is no question that many horses with “uncorrected laterality” are competing very successfully and at very high levels. We are very suspicious, however, that there is a lot of horse “wastage” when laterality is not addressed. The question is, how much longer could the horses perform if they were better laterally and longitudinally balanced? This seems like a very logical hypothesis. 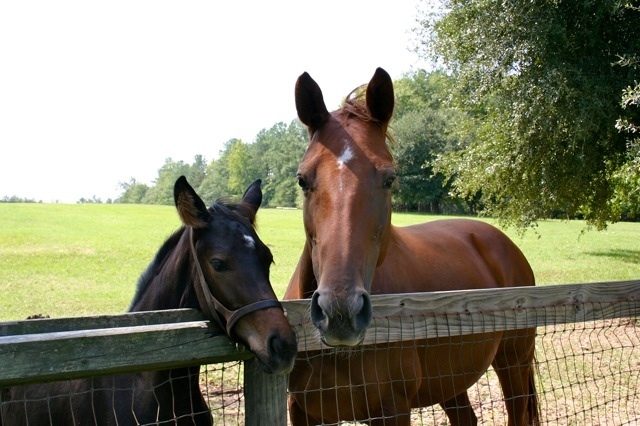 Our goal is to have horses live a longer, happier life performing well in a pain free manner. We are in a very good position, as we have a coming three year old that we will start when we get home. I will be able to more closely monitor her progress from start to finish. We cannot wait to get home to commence!